Following Peter Newman's brilliant debut, The Vagrant. This is the much-anticipated sequel, The Malice. In the south, the Breach stirs. Gamma's sword, the Malice, wakes, calling to be taken to battle once more. But the Vagrant has found a home now, made a life, and so he turns his back, ignoring its call. The sword cries out, frustrated, until another answers. Her name is Vesper. 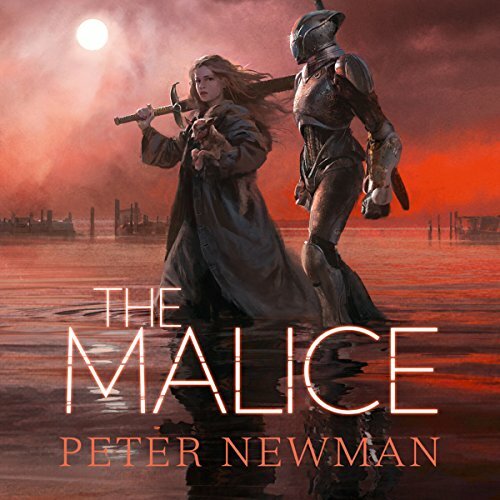 Peter Newman writes with a poetic language, unfolding the story with vivid descriptions and perfectly fitting metaphors and at the same time leaves much free space for the readers to fill in the gaps with their own imagination. This world is beautifully narrated by Jot Davies with a captivating, steady voice that makes you feel like you are there. It is a strange thing, to notice that, like the first novel, the beginning is a dark affair. The characters are disgusting, in both appearance and (in vesper's case) deed. The events are dark, and disheartening. Twice now, I've found myself wondering if I should even continue; when events take turns that are so appalling to my own desires. But, if one doesn't hate what one sees, how can one find joy in the changes that emerge. The ending, again so like the Vagrant, has a completely different taste to it. Some villains and enemies get their just due, and we find satisfaction in the bonds forged, certainly. And though this is a trick (again); it feels sure, and lighthearted compared to the blunt foreboding of the novel's beginning. This, though; seems to be the magic of the novels. Though great works are done, though many die, and much changes; one still feels a sickening sense of wrongness. In the Vagrant, this was at the Six, and their Shining City. And at the state of the world. Here, it is a much more dangerous wrongness, for it stems from Vesper herself. Her moral growth is still in progress, and one must wonder if she has learned nothing between her initial encounter with the First, and her final conversation with the keeper of The Seven. Her good intentions, and the lies they bring, may have dire consequences. But, I've yet to read the final book, so all is conjecture. Vesper is a glorious main character. Very flawed, as a result of her naivety and good intentions. She is the type of heroine to be learned from. She is the embodiment of our generational successors; and her relationship with the Vagrant and the world she discovers is a unique glimpse into the mess that is each generation's attempt to set straight the world their forebears have so skewed. One can only hope that such a complex plight can be portrayed as well as it has been presented.